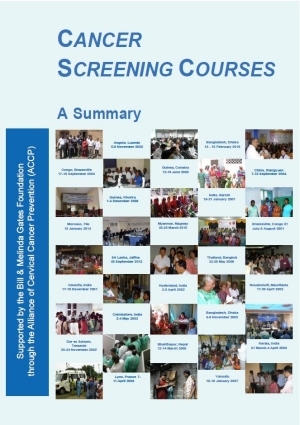 Capacity building within the health services of low- and middle-income countries to support their cancer control programmes is an important mandate of the Screening Group. The Group organizes new training programmes and provides technical support to existing programmes, the majority of which aim to develop a core group of master trainers and to equip these master trainers with the resources and materials they need to independently conduct training programmes in their own countries. Most of our courses are now structured to provide didactic online modules so that trainees can get adequate practical exposure to various clinical interventions.